I write this after feasting on another lasagne for dinner and I really could not hold this recipe from you anymore. It’s delicious and worthy in every kitchen, whether you’re vegan or not. I am also thinking it would be the perfect addition to a christmas eve dinner, so it’s just in time for you to start your planning! This past year lasagne has been making a regular appearance on my dinner table. 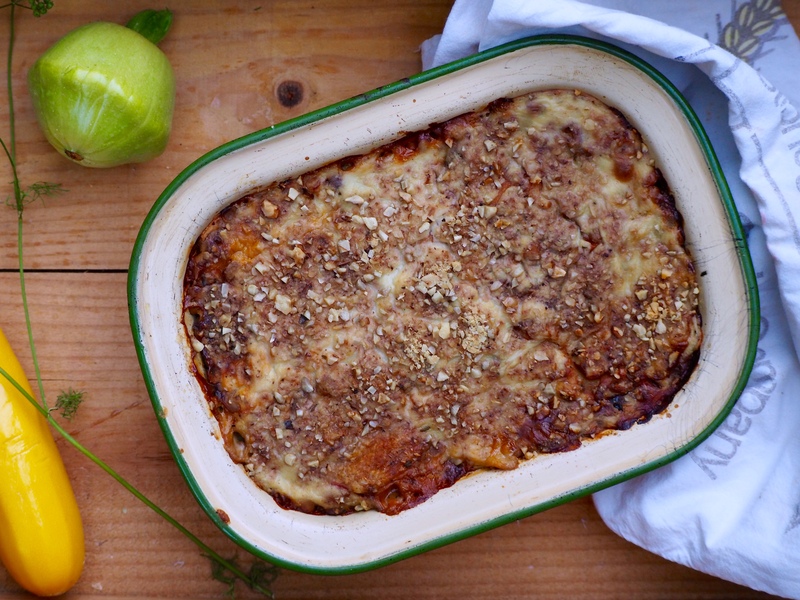 It’s simple to make vegetarian lasagne but I found it a little trickier to make it vegan and still keep all the delicious and comforting flavours. I have made mushroom lasagne, creamy carrot and lentil lasagne, eggplant lasagne with lemony ricotta and the list goes on. But this recipe is my absolute favourite. It’s creamy, hearty, warming and oh so satisfying. 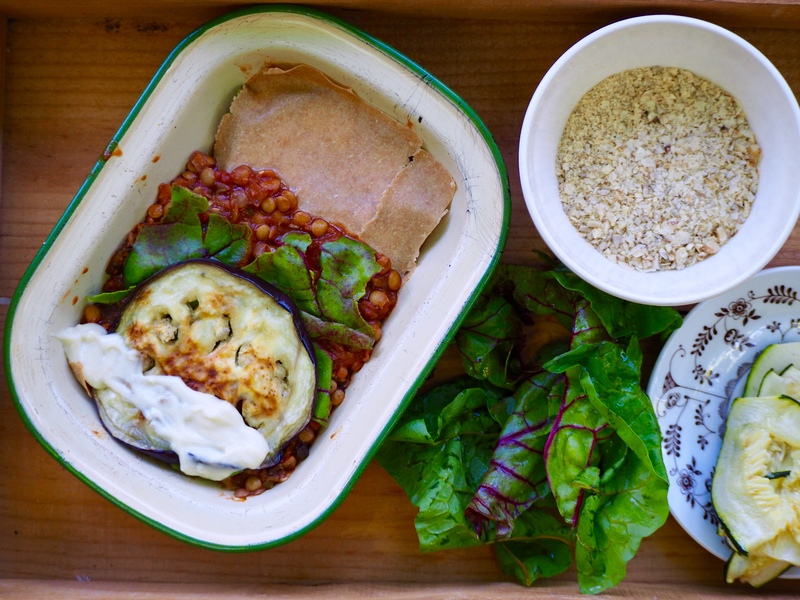 The layers consist of lentil bolognese, which to me is one of the greatest things ever, a vegan béchamel sauce, grilled vegetables, fresh spinach and all topped off with a home-made vegan parmesan. I used some fresh spelt pasta but choose whatever pasta you like although try and make it a healthy choice. I often make the lentil bolognese as an easy midweek meal over raw zucchini noodles, spelt pasta or quinoa. Please do try this as it is a delicious alternative to the regular spaghetti bolognese. 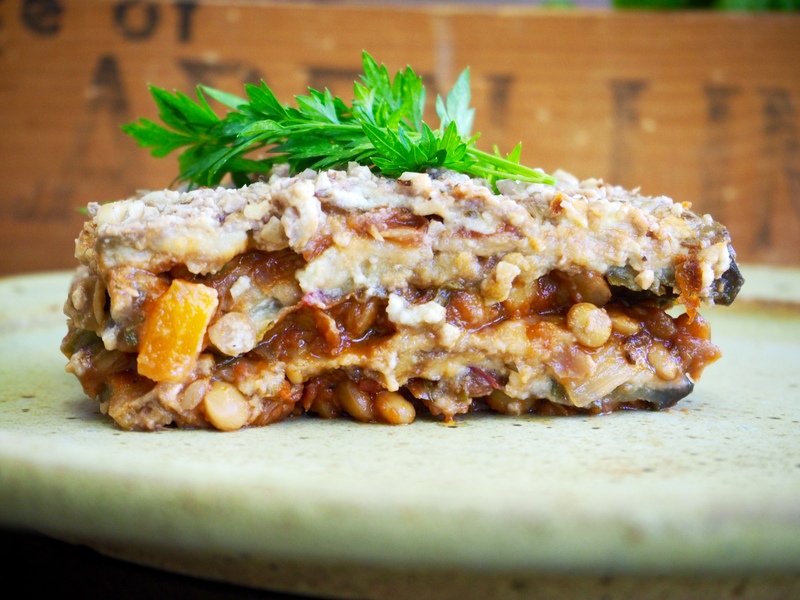 The lentil bolognese can be adapted with whatever vegetables you have on hand, celery is great and sweet potato too. The mushrooms add a nice richness so if you have them on hand do include. I often just throw in any extra vegetables hiding at the bottom of the fridge. I like to buy a large jar of charred capsicum from selected supermarkets or gourmet food stores, they taste delicious and are great addition to many dishes. It may seem like a huge ingredient list and mammoth task but its not too complicated and most parts can be made in advance. 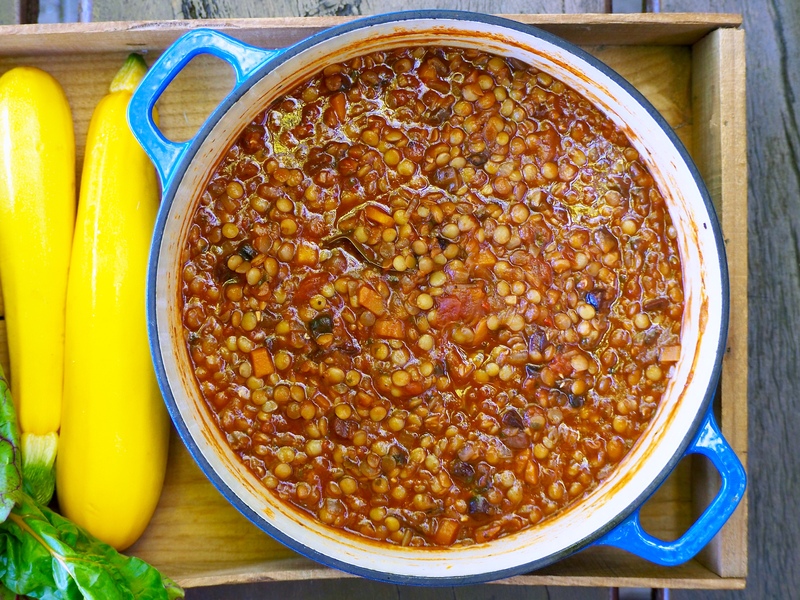 If soaking the lentils in advance simply place in a large bowl and cover generously with filtered water and a squeeze of lemon. To cook the lentils drain off the soaking water (if applicable) and place in a saucepan with 2 bay leaves and cover generously with water. Bring to a gentle simmer before covering and cooking for 20-25 minutes, or until tender. Drain, rinse with cold water and set aside. To start the bolognese heat the olive oil in a large pan, add the chopped onion and sauté over medium heat for 5 minutes. The onion needs to gently sweat rather than colour. Add in the garlic, mushrooms, carrot and chilli while continuing to cook gently for another 5 or so minutes. Add in the tin tomatoes, then 2 C of water, followed by the tomato paste, fresh herbs, kalamata olives, charred capsicum and red wine. Bring to a simmer before covering and cooking for 35-45 minutes. Season to taste with salt and pepper. Set aside. To make the béchamel sauce gently heat the olive oil in a small sauce pan. Add in the chickpea flour and cook for 2-3 minutes. Slowly add the milk a little at a time, whisking constantly. Continue to whisk over a gently heat until it starts to thicken and bubble. Let it cook for another 2 minutes before taking off the heat. Add the nutritional yeast, nutmeg and season to taste. Set aside. To make the vegan parmesan simply finely chop the sunflower seeds and walnuts and combine in a small bowl with the nutritional yeast and season to taste with salt and pepper. Lastly, preheat a grill to high. Brush the eggplant and zucchini slices with olive oil before placing in a single layer under the grill. Cook each side for around 5 minutes, or until golden brown. Finally its time to assemble. Preheat the oven to 180 degrees celcius. In a large baking or lasagne dish (30 x 20 cm) place a spoonful of lentil bolognese. Spread over the base of the dish before following with pasta sheets, lentil bolognese, grilled zuchinni and eggplant, fresh spinach/chard and a drizzle of the béchamel. Continue these layers until all ingredients are used, making sure you save 1/4 of the béchamel for the final top layer. Sprinkle over the raw parmesan and cover with a lid. Bake for 40-45 minutes, before removing the lid and baking for a further 15 minutes. Leave to sit for 10 minutes before serving. I like to pop a few potatoes in at the same time for delicious whole baked potatoes. I also serve with a fresh green salad.